The Blanc de Hotot is a medium-sized rabbit breed originally developed in France. 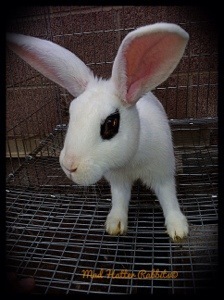 It is a compact, thickset white rabbit with spectacle-like black rings around each dark eye. First bred in Hotot-en-Auge, Normandy, France in the early 1900s, the breed spread throughout Europe and into North America by the 1920s. Initially unpopular in the United States, the Hotot (pronounced oh-toe) died out in the U.S., and suffered population decline in World War II-era Europe. It began to spread again in the 1960s and 1970s, and was re-imported to the U.S. in 1978. Today it is recognized by the British Rabbit Council and the American Rabbit Breeders Association, but is considered globally endangered, with a listing of “threatened” status by the American Livestock Breeds Conservancy. 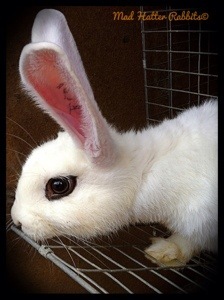 Blanc de Hotot are the #1 rare breed rabbit in the U.S. as listed by the 2010 Rare Breed Rabbit list. Our herd was started from Trinity Hallow and Rick Cole stock. Thank you for helping us get started with the “rocker” bunnies!